If I had to choose, the candy cane "flavor" of Hershey's kisses would be my favorite. I'm one of the few people who wouldn't pick chocolate, I know, but these candy cane kisses are SO addicting. I cannot eat just one. A few years ago, I found a recipe incorporating them into a chocolate cookie, and they were amazing. 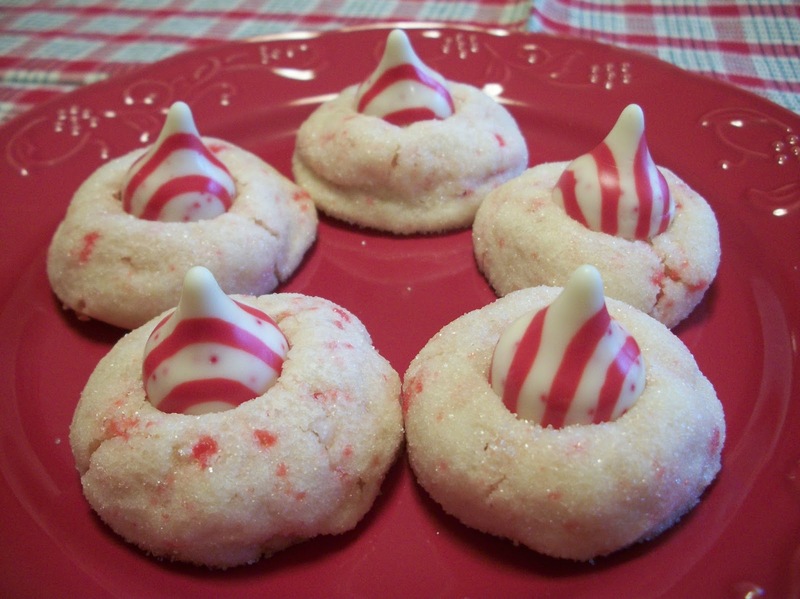 Those Chocolate Peppermint Swirl Cookies have become a part of my regular Christmas-cookie rotation now! 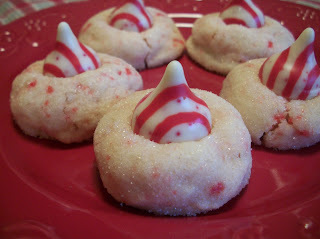 But I love those kisses so much, I thought I needed another way to use them in a cookie. So here's another variety - a traditional dough is peppermint-ified with crushed candy canes, chopped candy cane kisses, and then a candy cane kiss on top. These are just what you need for an after dinner treat, and besides being oh so tasty, they are oh so pretty. And if you can't depart from the traditional Hershey's kiss, you can use them in Chocolate Kissed Gingerbread or Macaroon Kisses! Find more great stuff at Inspiration Monday, Inspire Me, Mix it Up, Show and Share, Fabulous, Tasty Tuesday, Clever Chicks, Create Link Inspire, Favorite Things, Showcase Your Talent, Foodie Friday. Place candy canes in food processor and pulse until they are completely crushed. Combine powdered sugar and butterin large bowl. Beat until fluffy at medium speed. Add in eggs, vanilla and peppermint extract and beat until incorporated. 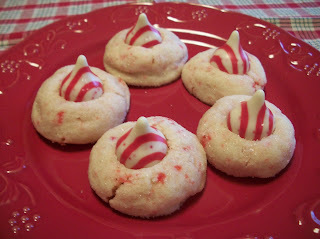 Combine flour, crushed candy canes, baking powder and salt in a separate bowl. Add flour mixture to wet mixture and beat until well blended (mixture will be kind of dry). Finely chop about 12 of the candy kisses; then stir them into the batter. Shape dough into 1 inch balls; roll in sugar. Place 1-inch apart on a parchment paper or silpat-lined cookie sheet. Bake at 350 for 10-12 minutes until set. Remove from oven and immediately press a Candy Cane Kiss in the center of each cookie. Let rest on the cookie sheet for 2-3 minutes before transferring to a wire rack to cool completely. Makes about 4 dozen. I did a little happy dance inside at the words "triple peppermint". Can't wait to try these!